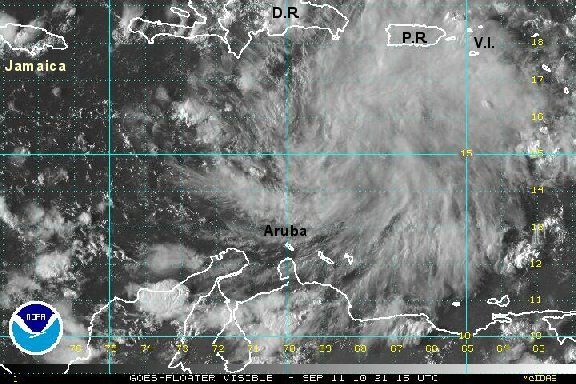 We have been watching a disturbed area of weather for almost three days now in the southeast Caribbean Sea. The first few days were of little concern. There did not appear to be a low level circulation and climatology is not in favor of a tropical cyclone developing there. 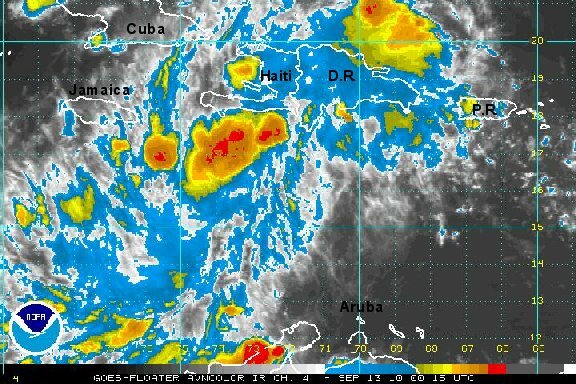 Today a bigger cluster of deep convection is centered farther north in the eastern Caribbean. This one appears to also not yet have an organized surface low. This area will be watched closely today! As of 11 am edt / ast the tropical disturbance was centered in the eastern Caribbean very roughly near 15.0° N / 66.0° W or about 200 miles south of Puerto Rico. Top sustained winds are estimated at 30 mph. Movement is west at roughly 15-20 mph. Pressure estimated at 1008 mb. Forecasts take this system west northwest over the next several days. The low will be near Jamaica by early Tuesday, near the Cayman Islands by early Wednesday and near Cozumela and Cancun by late Wednesday. After this in the long range....the low is forecast to move over the Bay of Campeche into eastern Mexico by around Friday / Saturday. Keep in mind that this is a very early forecast and suspect to change. Interests in Hispaniola, Jamaica, the Cayman Islands, Belize, and eastern Mexico should follow the progress of ths system. Nothing important has happened today. There still does not appear to be a low level circulation yet. A large area of convection continues to be associated with the tropical disturbance. We will continue to watch for development. As of 5 pm edt / ast the tropical disturbance was centered in the eastern Caribbean very roughly near 15.5° N / 69.0° W or about 200 miles south southeast of the Dominican Republic. Top sustained winds are estimated at 30 mph. Movement is west at roughly 15-20 mph. Pressure estimated at 1008 mb. Forecasts take this system west northwest over the next several days. 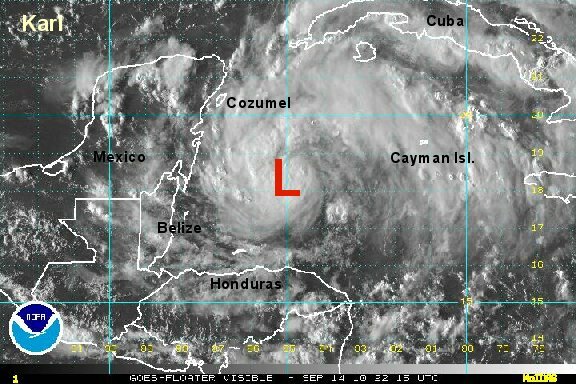 The low will be near Jamaica by early Tuesday, near the Cayman Islands by early Wednesday and near Cozumel and Cancun by late Wednesday. After this in the long range....the low is forecast to move over the Bay of Campeche into eastern Mexico by around Friday / Saturday. Keep in mind that this is a very early forecast and suspect to change. Visible satellite pictures show that a weak low is now forming with the tropical disturbance. Last night most of the convection died, but has again exploded and now looks similar to yesterday. As of 7 am edt / ast the tropical disturbance was centered in the central Caribbean near 14.6° N / 70.3° W or about 500 miles east southeast of Kingston, Jamaica. Top sustained winds are estimated at 30 mph. Movement is west northwest at roughly 15 mph. Pressure estimated at 1008 mb. The models have shifted a little northward. Forecasts take this system west northwest over the next few days. The low will be near Jamaica by Monday afternoon, near the Cayman Islands by Tuesday afternoon, and in the northwest Caribbean by late Wednesday. The overall impression shows that convection has decreased some from this morning. It does appear that a surface low is developing though and a tropical depression could from within the next 24 hours. Depending on how organzied this disturbance is tomorrow, Jamaica could see heavy showers on Monday. As of 3 pm edt / ast the tropical disturbance was centered in the central Caribbean near 16.0° N / 72.3° W or about 340 miles southeast of Kingston, Jamaica. Top sustained winds are estimated at 30 mph. Movement is west northwest at 17 mph. Pressure estimated at 1008 mb. Forecasts take this system west northwest over the next few days. The low will be near Jamaica by Monday afternoon, near the Cayman Islands by Tuesday afternoon, and in the northwest Caribbean by late Wednesday. 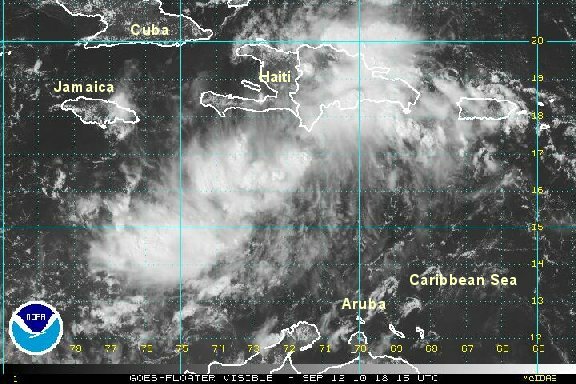 A hurricane hunter investigated today and did not find an organized circulation. Despite this, heavy rainfall is possible over Haiti and Jamaica as the disorganized system moves by tonight and tomorrow. As of 9 pm edt / ast the tropical disturbance was centered in the central Caribbean near 16.0° N / 74.0° W or about 240 miles southeast of Kingston, Jamaica. Top sustained winds are estimated at 30 mph. Movement is west northwest at 15 mph. Pressure estimated at 1008 mb. 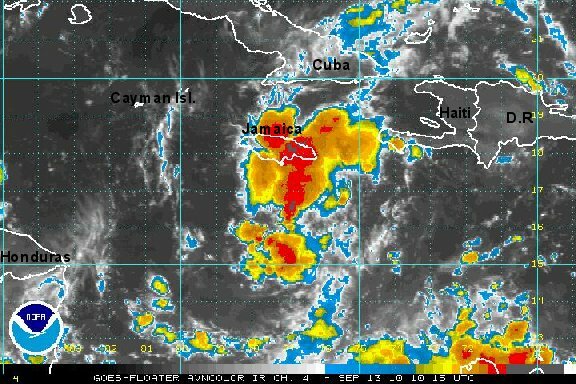 The tropical disturbance remains disorganized this morning but is still bringing heavy thundershowers to Jamaica. Winds are light. As of 7 am edt / ast the tropical disturbance was centered in the central Caribbean roughly near 16.0° N / 77.0° W or a little less than 150 miles south of Kingston, Jamaica. Top sustained winds are estimated at 25 mph. Movement is west at 15 mph. Pressure estimated at 1008 mb. Forecasts take this system west northwest over the next few days. The low will be near Jamaica today, near the Cayman Islands by Tomorrow afternoon, and in the northwest Caribbean by late Wednesday. 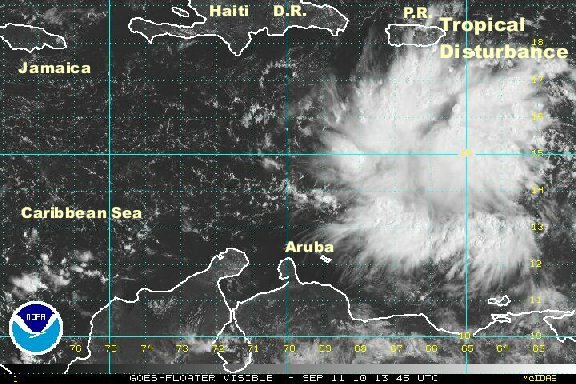 The tropical disturbance is finally starting to organize. This is not surprising at all since the western Caribbean is a much more favorable zone for tropical development in general. Visible satellite imagery shows what looks like a low level spin starting to form about 100 miles south southwest of kingston, Jamaica. 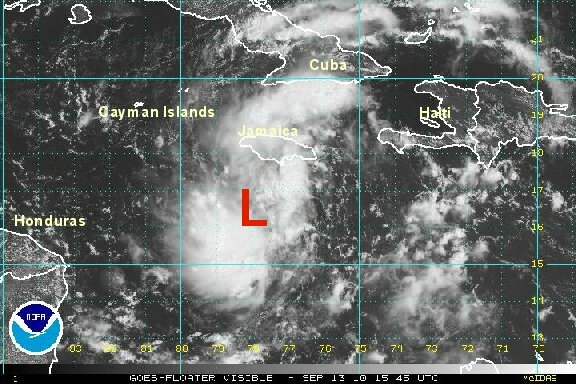 This low has a decent chance of becoming a tropical depression within the next 24 hours. As of 12 pm edt / ast the tropical disturbance was centered in the central Caribbean roughly near 16.5° N / 78.0° W or about 175 miles south southwest of Kingston, Jamaica. Top sustained winds are estimated at 30 mph. Movement is west northwest at 15 mph. Pressure estimated at 1007 mb. Forecasts take this system west northwest over the next few days. The low will be near the Cayman Islands by tomorrow and in the northwest Caribbean south of Cozumel by Wednesday. 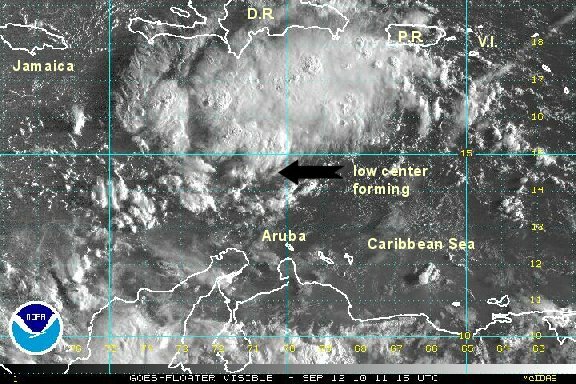 Interests in Jamaica, the Cayman Islands, Belize, and eastern Mexico should follow the progress of ths system. The tropical disturbance is still not organized this evening. It is possible that further development will occur before reaching Mexico in the next 36 hours. We will post the next update if the tropical disturbance starts to develop. Locally heavy rain can still be expected from Jamaica to the Cayman Islands west to Mexico south to Honduras. Tropical depression 13 has unofficially formed east of Belize and Mexico. It will make landfall by tomorrow, so strengthening will be limited. It is very possible that TD 13 will become a tropical storm before that time. The main impact will be heavy rain from the Yucatan peninsula south to Belize. Some heavy showers are near the Cayman islands also. As of 1 pm edt the unofficial tropical depression was centered near 18.0° N / 83.5° W or about 275 miles east of the Belize / Mexico border. Top sustained winds are estimated at 35 mph. Movement is west northwest at 15 mph. Pressure estimated at 1006 mb. The forecast call form the system to move over the Yucatan peninsula then back over the Bay of Campeche before its next landfall on the west side of the Bay of Campeche later this week. 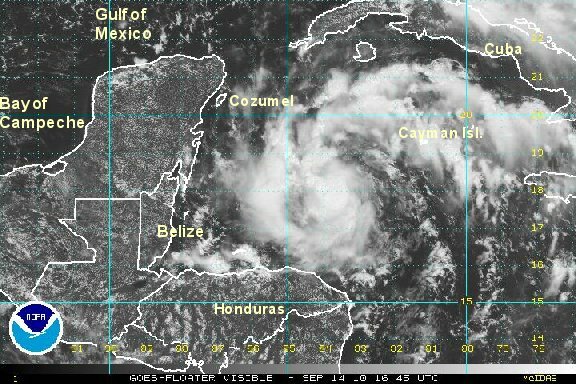 Interests in Belize, and eastern Mexico should follow the progress of ths system. As expected NHC classified the tropical disturbance.....but they skipped the tropical depression stage and went straight to tropical storm Karl. The reason was due to the fact that that hurricane hunter aircraft found strong enough winds this afternoon to do so. 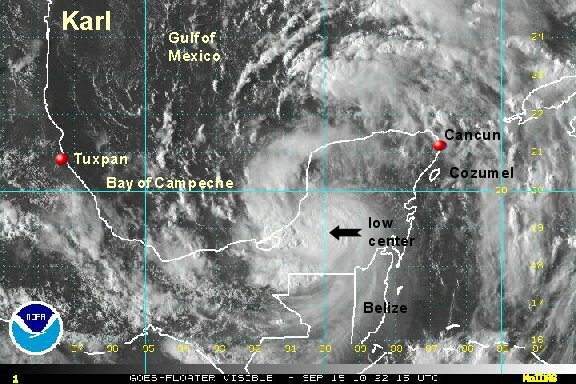 Karl appears to be quickly organizing and will make landfall between Cozumel and the Belize border by Wednesday morning. If karl continues to strengthen at its current rate is possibly could make landfall with winds of 60 mph or more. As of 7 pm edt tropical storm karl was centered near 18.5° N / 85.0° W or about 175 miles east of the Chetemal, Mexico. Top sustained winds are estimated at 45 mph (NHC 40 mph 5 pm advisory). Movement is west northwest at 15 mph. Pressure estimated at 1001 mb. The forecast has Karl moving over the Yucatan peninsula tomorrow then back over the Bay of Campeche before its next landfall on the west side of the Bay of Campechea few days later. karl has continued its strengthening trend overnight. Thankfully it has been a slow steady strengthening instead of the explosive development which we have seen with many hurricanes this year. It is still possible that Karl will make landfall as a minimal hurricane, but it is running out of time as it is just offshore by about 4-5 hours. Landfall will be roughly 50 miles north of the Belize border in Mexico or nera / just north of Chetemal, Mexico. As of 6 am edt / 5 am cdt tropical storm karl was centered near 18.5° N / 86.9° W or about 90 miles east of the Chetemal, Mexico. Top sustained winds are estimated at 65 mph (NHC 65 mph 5 am advisory). Movement is west northwest at 15 mph. Pressure estimated at 995 mb. The forecast has Karl moving over the Yucatan peninsula today then back over the Bay of Campeche tonight before its next landfall on the west side of the Bay of Campeche Friday evening. Karl may become a hurricane before its second landfall. Karl made landfall on the coast east of Chetumal around 9 am edt / 8 am cdt. Karl is slowly weakening today over the southern Yucatan peninsula. Heavy rain is being reported at Chetumal, Mexico with a west wind of 23 mph at last check. This indicates that karl has moved just north of Chetumal and that it is weakening. It should regain strength overnight as karl moves over the Bay of Campeche. As of 1 pm edt / 12 pm cdt tropical storm karl was centered near 18.6° N / 88.6° W or just northwest of Chetumal, Mexico. Top sustained winds are estimated at 45 mph (NHC 60 mph 11 am advisory). Movement is west at 14 mph. Pressure estimated at 992 mb. Karl is still losing strength as it moves across the Yucatan. Top sustained winds are estimated at 40 mph - minimal tropical storm force. It's possible that the winds are even lower than that. The hurricane center will likely have winds at 40 or 35 mph on the 10 pm cdt advisory. Karl will start strengthening again on Thursday into Friday and it's quiet possible that it will become a hurricane. 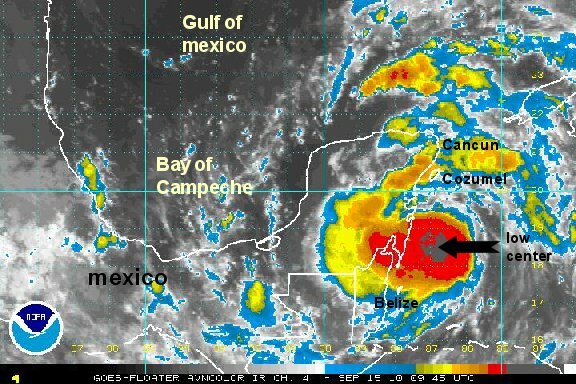 Interests on the western side of the Bay of Campeche should make emergeny preparations well before Karl's arrival. 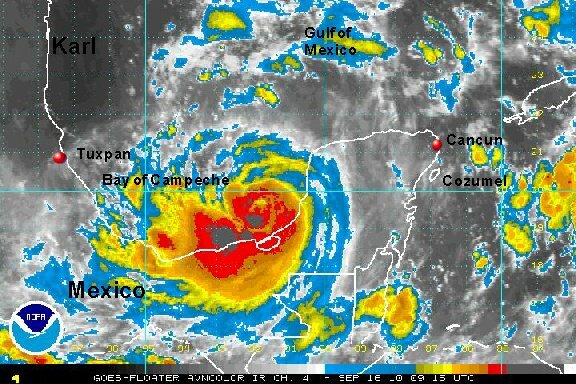 As of 7 pm edt / 6 pm cdt tropical storm karl was centered near 19.0° N / 90.0° W or about 60 miles southeast of Campeche, Mexico. Top sustained winds are estimated at 40 mph (NHC 45 mph 5 pm advisory). Movement is west northwest at 15 mph. Pressure estimated at 997 mb. The forecast has Karl moving off of the Yucatan peninsula by midnight Wednesday night then over Bay of Campeche before its next landfall on the west side of the Bay of Campeche near Tuxpan Friday evening. Karl may become a hurricane before its second landfall. 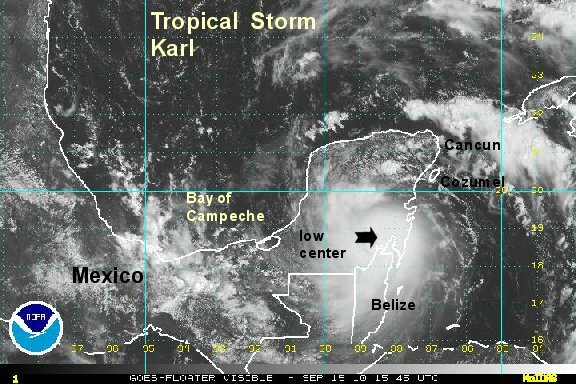 Interests on the Mexican Bay of Campeche coast and southwestern Yucatan should follow the progress of Karl. Karl has been over the Bay of Campeche for several hours and is quickly organizing. If fact, there appears to be an eye structure forming already. Very deep convection is building on the south side of the circulation. Heavy rainfall of 5-10" will be seen near the path of Karl. As of 7 am edt / 6 am cdt tropical storm karl was centered near 19.9° N / 91.9° W or about 90 miles west of Campeche, Mexico / 365 east southeast of Tuxpan, Mexico. Top sustained winds are estimated at 55 mph (NHC 50 mph 5 am advisory). Movement is west northwest at 13 mph. Pressure estimated at 1000 mb by the hurricane center. The forecast has Karl over Bay of Campeche before until its next landfall near or south of Tuxpan Friday evening. Karl will likely become a hurricane before its second landfall. Interests on the Mexican Bay of Campeche coast should follow the progress of Karl.